Several years ago I was at an eating disorder conference where one of the presenters showed a video clip from Oprah about a very young girl (I think 5 -6 years old) who had anorexia nervosa. They interviewed the mom in the video and she repeatedly stated that she had no idea where the daughter got her beliefs. Following the interview they showed clips of mom drinking slim fast, commenting on her own body, and sending nonverbal messages of body dislike. To the viewer it was easy to see that mom had communicated these messages both verbally and non-verbally in how she treated her body, however the mom couldn’t see it. I’ve seen this same pattern repeated over and over, impacting people of all ages, related to restrictive eating (dieting) and eating disorders. Typically it’s a mom and daughter and they’re seeing me because the daughter is struggling with her eating and body image concerns. Mom usually says something along the lines of, “I don’t know why she believes she needs to lose weight or change her body.” Or, “I don’t know why she can’t gain weight.” Or more aptly stated, “I don’t know why she’s afraid of gaining weight.” As the appointment(s) continue I usually uncover that mom does not like her body, believes that she needs to lose weight, is dieting, has a history of frequent dieting, frequently talks about her body negatively, and talks about the negative health consequences of living in her body. Mom may not comment any on the child’s body, yet she doesn’t have to because the message she’s sending is clear that her body is unacceptable and therefore her daughter’s body is too. 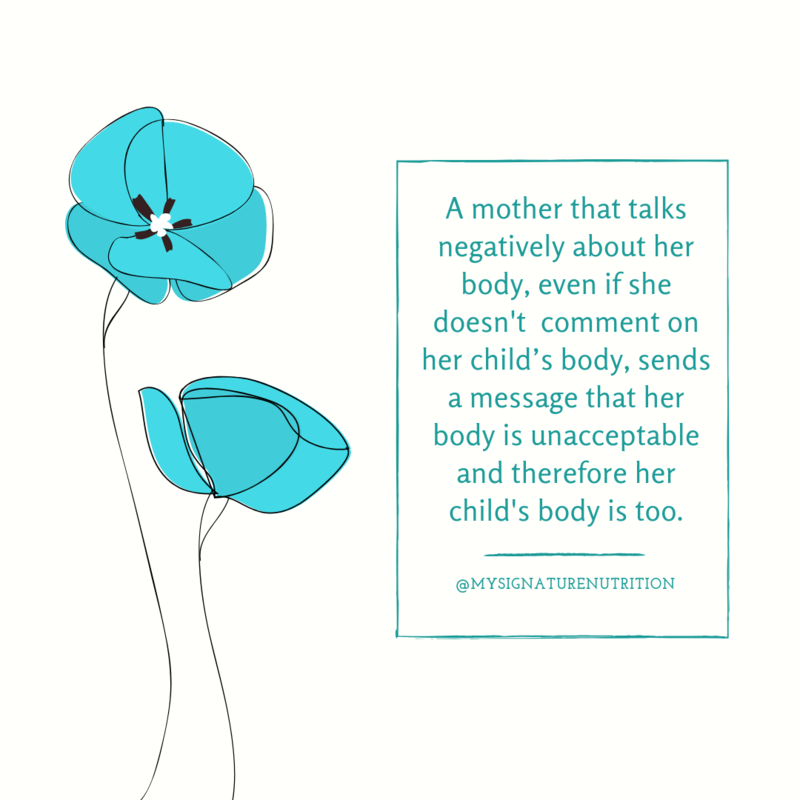 Regardless of the child’s body shape or size it sends a message that their body isn’t okay. Model self acceptance and self compassion. The cycle of dieting starts with body hate, dislike, or perceived inadequacy. The culture at large (diet culture), your family, and your friends reinforce what you perceive to be acceptable or beautiful. In a family trapped in the legacy of dieting a mother (and/or father) will model body hate and mistrust. She’ll model that her body is not okay as it is and pass this same standard on to her children. To break the legacy of dieting mom has to model self acceptance (accepting herself as she is) and self compassion (being kind to herself and her body even when she feels inadequate). This means challenging the messages you’ve received from the culture, your friends and family. It means saying that you’re enough as you are and repeatedly communicating that to your children so that they can receive a different message- that your worth and thus their worth do not come from their body shape or size. Make food and exercise neutral (reject diet culture). Diet culture reinforces that food is either good or bad and that exercise should be done to change your body. This is the same message that is communicated in the legacy of dieting- that to be good and feel good you must restrict your eating and exercise. To end the legacy of dieting, you must reject diet culture. That means changing your relationship with food, creating food neutrality- no longer labeling foods as good or bad, healthy or unhealthy, clean, etc. It also means shifting your perspective on exercise from one of punishment and compensation to one of joy and pleasure. This is basically the process of intuitive eating. When you do this, you build body trust and attunement with internal cues, needs, and desires. It’s modeling self care and compassion, not self control. It creates space for exploration and teaches your children to trust their body. This breaks the legacy of dieting! Don’t comment on other people’s bodies. In the legacy of dieting, just like in diet culture, weight stigma is reinforced through body shame and body judgment. Whether you know the person (a friend or family member) or if they’re a stranger- it doesn’t matter. Commenting on others bodies (positive or negative) reinforces that certain body shapes and sizes are better or worse. It also reinforces the (false) belief that body weight, shape, and size comes from personal choice and that attacks on people living in higher weight bodies are thus justified. (They’re not.) It also sends a message that you’re always looking/judging and if you’re always looking and judging other people then you’re also always looking and judging those closest to you- whether you directly say it or not. It fosters a relationship of shame and mistrust in those closest to us. It reinforces the need to use disordered behaviors to maintain the “right” external appearance at all cost. It perpetuates the legacy of dieting. To end the legacy of dieting you must refrain from commenting on bodies period. This means everyone- yours, other family members, friends, acquaintances, and even strangers. Treat all members of your family the same when it comes to body, food, eating and exercise. Use Ellyn Satter’s Division of Responsibility With Feeding and treat all family members the same. Don’t make one child have less food or follow specific rules when it comes to eating while nobody else has to. I often see this in families, where one child is in a higher weight body and the other(s) are not. The child that’s at a higher weight receives smaller portions, is forbidden from having dessert, is required to eat only at the table, and is forced to exercise. This reinforces the legacy of dieting- teaching dieting and disordered beahviors, which research shows do not work and only increases binge eating patterns and an unhealthy relationship with food. 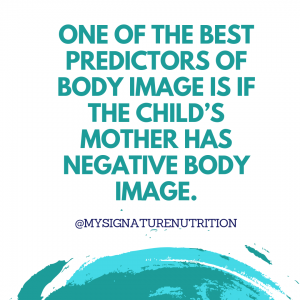 It also reinforces weight stigma and says that one of your children is better (or worse) than the others because of their body shape or size. The sad reality is, often the child doesn’t eat differently than anyone else- they just live in a larger body. 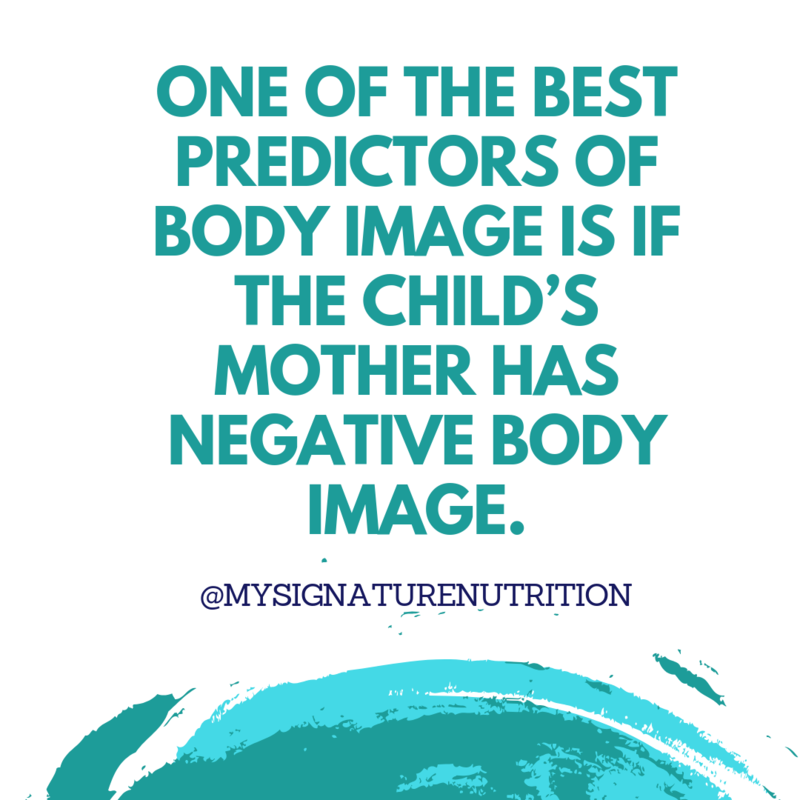 Focus on their body only lays the groundwork for the intergenerational transmission of food and weight focus and decreases their health and well-being. To end the legacy of dieting- don’t single out your children. Use the division of responsibility with feeding and create structure, consistency, and flexibility with eating. This fosters a long –term healthy relationship with food! Do your own work. If you’ve grown up in the legacy of dieting then it’s all you know. You’re weight focused, food focused, and believe that your worth comes from what you eat and what you look like. It’s a difficult place to get out of. 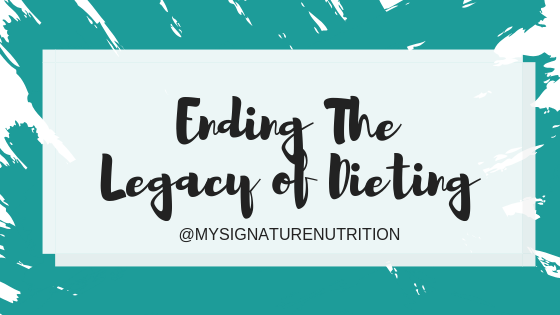 However, if you truly want to end the legacy so that your children and your children’s children can be free, then it’s extremely important for you to do your own work with a therapist and dietitian. If you’re not able to see how entrenched you are in diet culture/the legacy of dieting then you won’t be able to change it for future generations to come. It’s often difficult to do your own work, but to end the legacy for your children and your children’s children then it is something required! Breaking the legacy of dieting is possible but will require major shifts in thinking and the actions that you take around food. The work isn’t easy but it’s definitely worth it and will not only change your life, but your children’s life and your children’s, children’s life. That’s pretty amazing and definitely worth it!